It’s worth over $50 million and makes a clear signal that the new golden stadium for Haifa is nearing completion. The new multiplex cinema and commercial centre will cover a huge space – Globes.co.il informs. Haifa Economic Corporation Ltd. today published a tender for the construction and operation of a multiplex cinema and stores as part of the new Haifa football stadium complex. The NIS 200 million tender relates to an area of tens of thousands of square meters for a multiplex cinema and a further 10,000 square meters of commercial space for stores. The space has been leased to the Haifa Economic Corporation by the Haifa Municipality, which will in turn lease the commercial space for cinemas and stores. 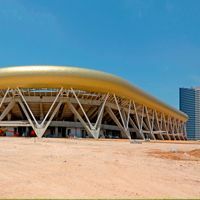 The Sammy Ofer Stadium will have 30,000 seats when completed and a car park for 1,500 vehicles with easy access to the main highways and public transport routes.